Thirty years ago, today, Harry Chapin died on the Long Island Expressway. He's probably best know for Cat's in the Cradle - which is one of my favorite songs. Ten years ago, this song was ranked number 186 of 365 on the RIAA list of Songs of the Century. Harry Chapin was driving in the left lane on the LIE near exit 40 in Jericho when he put on his emergency flashers because of either a mechanical or medical problem (possibly a heart attack). After veering into a couple cars he was rammed by a tractor trailer. The official cause of death was a heart attack, but it couldn't be determined if it happened before of after the initial car accident. Harry Chapin would have been 68 years old if he was still alive. Last summer, I was back in my hometown (Huntington Station, NY) helping my former sixth grade teacher, Ms. Cooke, scan her 30+ years worth of student photos into Facebook. 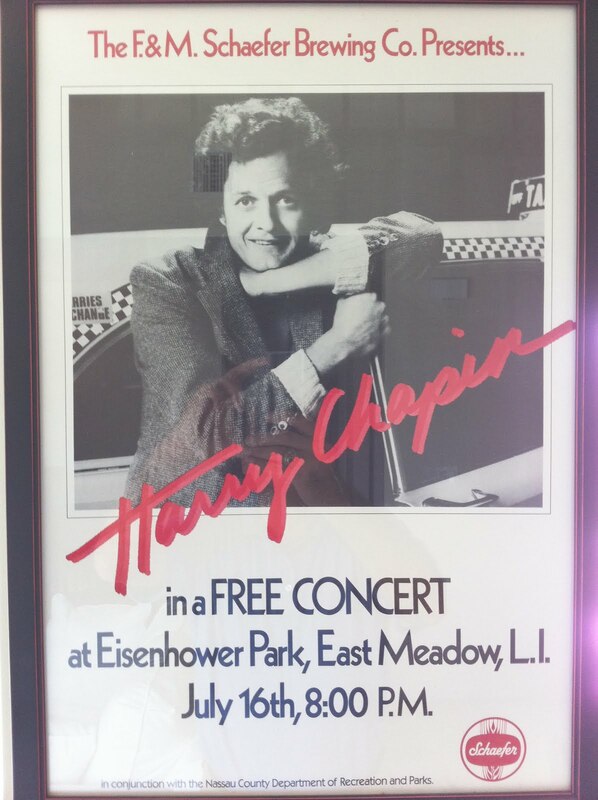 As soon as I mentioned to Ms. Cooke that I was planning to stop by the local cemetery to visit Harry Chapin's grave, she pointed to the following framed concert poster that hung on the wall in her condo. Harry Chapin died while he was driving to this concert. Tonight, at 8:30 p.m., there will be a celebration at Hekscher Park to honor his life and work. People are encouraged to bring canned goods to be donated to charity.